Former IAM Local Lodge 2003 Educator Teresa Blevins, who lost her sight in 2009, is one of many to receive a trained guide dog from GDA. IAM District Lodge 776 in Fort Worth, TX hit the links recently to raise over $15,000 for the Guide Dogs of America (GDA). 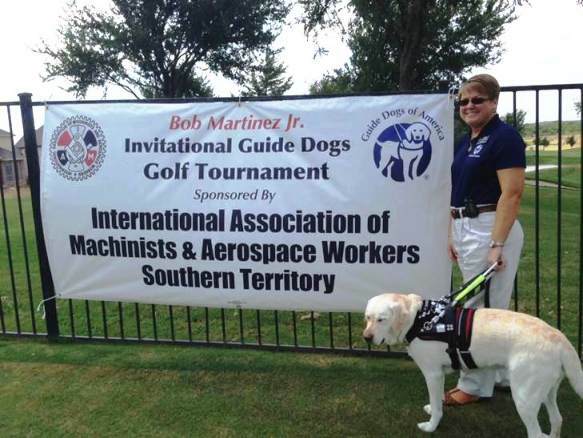 The IAM teamed up with the Office and Professional Employees International Union (OPEIU) and the United Food and Commercial Workers (UFCW) to bring together 19 teams of 76 golfers to Eagle Mountain Golf Course in Fort Worth for the Bob Martinez, Jr., Invitational Guide Dogs Golf Tournament. IAM Southern Territory General Vice President Mark Blondin, Headquarters GVP Bob Martinez, Jr., and several Aerospace Coordinators also took part in the fundraising activities. The Guide Dogs of America is an organization dedicated to providing guide dogs and instruction in their use, free of charge, to blind and visually-impaired men and women from the United States and Canada so that they may continue to pursue their goals with increased mobility and independence.